Did you ever notice that in almost every great war in history, France has been involved in some way? Here’s an example: the war between the U.S.A., France, and other allies against Great Britain that launched America. 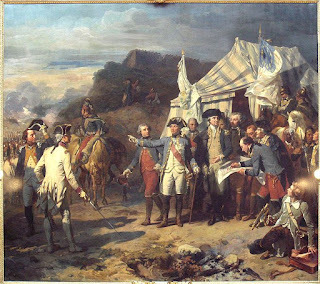 Pictured is Washington and Rochambeau issuing their orders at Yorktown, October, 1781. In this combined-operations campaign, the French provided a fleet and an army. This campaign won the war.